As you work through the restoring the third lighthouse tablet, you'll unlock Gus and his blacksmith shop. To entice him to move back to Beacon Island, repair the mine entrance by spending 500 G and 10 Softwood Lumber. Then rebuild his shop by spending 500 G and 20 Softwood Lumber. 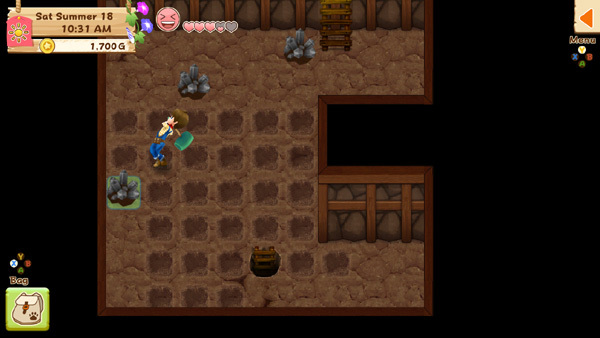 You'll eventually obtain a Hammer you can use to break the ore nodes you find while exploring the mine. The mine is 100 floors deep. On each floor you'll find a ladder back to the surface and a variety of ore nodes you can hit with your Hammer to obtain materials. The raw ore can be then processed by Gus at his blacksmith shop. Some villager requests will be for raw ore. The staircase down to the next floor is hidden in the dirt of the mine floor. You will use your Hoe to dig around the floor to discover the hidden staircase. The Hoe's powered-up levels will work while mining, so upgrade your Hoe at Gus' shop to expand its coverage when trying to uncover the stairs. The staircase down to the next floor will never be hidden under an ore node or next to the ladder back to the surface. You'll also need to upgrade your Hammer to the Expert Hammer to break the blue ore nodes staring from floor 31, and upgrade to the Master Hammer to break the orange ore nodes that appear starting on floor 61..
Time does progress while you are exploring the mine. Going back up the ladder to return to the surface will always take 2 hours of in-game time. As you reach mine floors that end in 1 or 6 (e.g., floor 1, 6, 11, 16, 21, etc. ), your progress will be recorded for quick access. When you enter the mine later you'll be prompted to jump to a 1-or-6 numbered floor. This allows you to work on going 5 floors at a time and then coming back another day to work on the 100-floor challenge. The last jump point is floor 96, as the mine stops at floor 100 and there isn't a floor 101 to jump to. You cannot save your game while in the mine.